Make a donation to Compas de Nicaragua on behalf of a loved one and not only will your friends and family be honored, but someone will be given the gift of hope! ​Please consider honoring your loved ones, and give a gift of hope for someone like William or Karla! Please make a donation now! Any amount will have an impact! P.S. We'd like to share these picture to remind you of some of what your support has helped Compas accomplish! Edda’s clothing repair work. With her new sewing machine she can carry out work and better support her family. 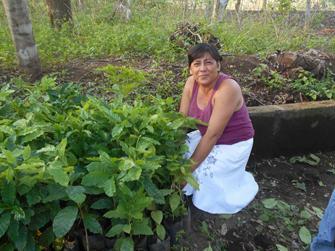 The sale of Nereyda’s coffee helps her support her family. Howling Monkeys, whose habitat is being saved through the sale of Howling Monkey Coffee, are frequent visitors to her farm.